DALLAS, June 19, 2018 /PRNewswire/ -- Texas Instruments (TI) (NASDAQ: TXN) today introduced three new amplifiers with a unique combination of high speed and high precision, allowing designers to create more accurate circuits for error-sensitive applications. The new devices support more precise measurement and faster processing of a wide variety of input signals in test and measurement, medical, and data-acquisition systems. 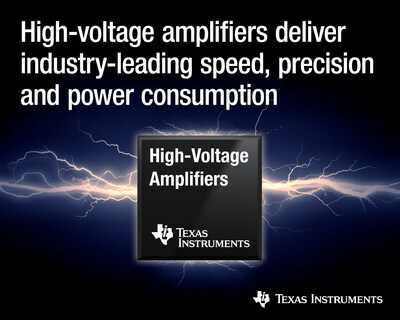 To learn more about TI’s new amplifiers, with maximum supply voltages ranging from 27 V to 36 V, see www.ti.com/hvamps-pr. OPA2810: 27-V junction gate field-effect transistor (JFET)-input dual operational amplifier (op amp), 120-MHz bandwidth, 500-µV max offset voltage. OPA189: 36-V zero-drift op amp, 14-MHz bandwidth, multiplexer (MUX) friendly. THS3491: 32-V current-feedback amplifier, 900-MHz small-signal bandwidth, ±420-mA output current. The high bandwidths of the OPA2810 and OPA189 enable high-gain configurations and faster response times for more accurate measurements. Designers can use the THS3491 current-feedback amplifier’s wide small-signal bandwidth, high slew rate and output current of ±420 mA to achieve low distortion and high output power levels. The THS3491 is capable of 10-Vpeak-to-peak output levels at 200 MHz into 100-Ω loads for test and measurement systems, such as arbitrary waveform generators, laser diode drivers and high capacitive load drive applications. With an industry-leading maximum offset and lowest voltage noise of 5.7 nV/√Hz for 27-V amplifiers in the 100- to 200-MHz bandwidth range, the OPA2810 op amp allows engineers to achieve more precise measurements in data-acquisition and signal-processing applications. The OPA189 is the widest bandwidth zero-drift op amp with the lowest noise of 5.2 nV/√Hz. With a low maximum drift of 0.02 μV/°C, the OPA189 also minimizes temperature error without calibration, increasing system accuracy over an extended temperature range. The 120-MHz OPA2810 op amp offers best-in-class current consumption of 3.6 mA, while providing excellent signal-to-noise ratio and distortion. Designed for applications that require high gain and low distortion in power-sensitive designs, the OPA189 is the lowest power zero-drift op amp with a 14-MHz bandwidth. This device enables engineers to design high-resolution, noise-sensitive industrial systems while only consuming 1.3 mA of quiescent current, which can benefit analog input modules, and battery and LCD test equipment. Engineers can jump-start the design of their high-voltage systems with the Reference Design Maximizing Signal Dynamic Range for True 10 Vpp Differential Input to 20-Bit ADC. TI’s new high-voltage amplifiers are available with packages and pricing as listed in the table below. The OPA189 and THS3491 amplifiers are now available in volume quantities through the TI store and authorized distributors. Additionally, the OPA2810DGKEVM evaluation module is available today through the TI store and authorized distributors, with production quantities of the OPA2810 amplifier available in 3Q 2018. Download the OPA2810, OPA189 and THS3491 data sheets. Learn about the advantages of JFET-input amplifiers in high-speed applications in this Analog Wire blog post. "Attenuator Amplifier Design to Maximize the Input Voltage of Differential ADCs." "Offset Correction Methods: Laser Trim, e-Trim™, and Chopper." "Zero-drift Amplifiers: Features and Benefits." Check out all of TI’s amplifier devices. TI E2E and e-trim are trademarks of Texas Instruments. All other trademarks belong to their respective owners.